Ober Ost is short for Oberbefehlshaber der gesamten Deutschen Streitkräfte im Osten, German for "Supreme Commander of All German Forces in the East" during World War I. It also has an implied double meaning, as in its own right, "Ober Ost" translates into "Upper East," which describes its geographic region in reference to the German Empire. In practice it refers not only to said commander, but also to his governing military staff and the district they controlled: Ober Ost was in command of the German section of the Eastern Front. Ober Ost was created in 1914, and its first leader was Paul von Hindenburg, a Prussian military hero. When the Chief of the General Staff Erich von Falkenhayn was dismissed from office in 1916, von Hindenburg replaced him, and Prince Leopold of Bavaria was given control of the Ober Ost. By October 1915, the German Army had advanced so far to the east, that Central Poland could be put under a civil administration. This administration was divided between the German Government General of Warsaw and the Austro-Hungarian Government General of Lublin. The military Ober Ost government from then on only controlled the conquered areas east and north of Central Poland. 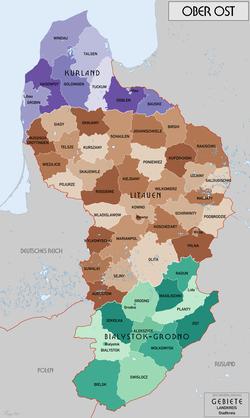 After the Treaty of Brest-Litovsk, the German Empire effectively controlled Lithuania, Latvia, Belarus, parts of Poland, and Courland, all of which were former territories of the Russian Empire. Ober Ost itself was assigned present-day Lithuania, Latvia, Belarus, Poland, and Courland. The land area it controlled was around 108,808 km2 (42,011 sq mi). In 1915, when large territories came under Ober Ost's administration as a result of military successes on the Eastern Front. Erich Ludendorff, von Hindenburg's second in command, set up a system of managing the large area now under its jurisdiction. Although von Hindenburg was technically in command, it was Ludendorff who had actual control of the administration. There were ten staff members, each with a specialty (finance, agriculture, etc.). The area was divided into the Courland District, the Lithuania District and the Bialystok-Grodno District, each overseen by a district commander. Ludendorff's plan was to make Ober Ost a colonial territory for the settlement of his troops after the war as well as provide a haven for German refugees from inner Russia. Ludendorff quickly organized Ober Ost so that it was a self-sustaining region, growing all its own food and even exporting surpluses to Berlin. The largest resource was one that Ludendorff was unable to exploit without difficulty. The local population had no interest in helping obtain a German victory as they had no say in their government and were subject to increasing requisitions and taxes. There were a great many problems with communication with indigenous persons within the Ober Ost. Among the upper class locals the soldiers could get by with French or German and in large villages the Jewish population would speak German or Yiddish, "which the Germans would somehow comprehend". In the rural areas and amongst peasant populations soldiers had to rely on interpreters who spoke Lithuanian, Latvian, or Polish. These language problems were not helped by the thinly-stretched administrations, which would sometimes number 100 men in an area as large as Rhode Island. The clergy were at times relied upon to spread messages to the masses, since this was an effective way of spreading a message to people who speak a different language. A young officer-administrator named Vagts related that he listened (through a translator) to a sermon by a priest who tells his congregation to stay off highways after nightfall, hand in firearms and not to have anything to do with Bolshevist agents, exactly as Vagts had told him to do earlier. Given the uncertain situation caused by the Russian October Revolution in 1917 and the Treaty of Brest-Litovsk in March 1918, some indigenes elected Duke Adolf Friedrich of Mecklenburg as head of the United Baltic Duchy, and the second duke of Urach as king of Lithuania, but these plans collapsed in November 1918. Vejas Gabriel Liulevicius postulates in his book War Land on the Eastern Front: Culture, National Identity, and German Occupation in World War I, that a line can be traced from Ober Ost's policies and assumptions to Nazi Germany's plans and attitudes towards Eastern Europe. His main argument is that "German troops developed a revulsion towards the 'East', and came to think of it as a timeless region beset by chaos, disease and barbarism", instead of what it really was, a region suffering from the ravages of warfare. He claims that the encounter with the East formed an idea of 'spaces and races' that needed to be "cleared and cleansed". Although he has garnered a great deal of evidence for his thesis, including government documents, letters and diaries, in German and Lithuanian, there are still problems with his work. For example, he does not say much about the reception of German policies by native populations. Also, he "makes almost no attempt to relate wartime occupation policies and practice in Ober Ost to those in Germany's colonial territories overseas". ^ Figes 1998, pp. xxiii, 548. ^ a b Gettman, Erin (June 2002). "The Baltic Region during WWI". Retrieved 2008-03-02. Davies, Norman (2003) . White Eagle, Red Star: The Polish–Soviet War, 1919–20 (2nd ed.). London: Random House. ISBN 0-7126-0694-7. Figes, Orlando (1998). A People's Tragedy: the Russian Revolution, 1891–1924. New York: Penguin Books. ISBN 0-670-85916-8. Schwonek, M. R. (January 2001). "Book Reviews: War Land on the Eastern Front: Culture, National Identity, and German Occupation in World War I by Vejas, Gabriel Liulevicius". The Journal of Military History. Lexington, Virginia: Virginia Military Institute and the George C. Marshall Foundation. 65 (1): 212–213. ISSN 0899-3718. JSTOR 2677470.